Hero MotoCorp, today launched the new Destini 125 scooter. The new Destini 125 will be available from tomorrow across Hero dealerships in the Delhi-NCR region, at a price of Rs. 54,650/- (Ex-Showroom) for the Lx variant and Rs. 57,500/- (Ex-Showroom) for the Vx variant. The retail sales of the Destini 125 in other markets across the country will commence over the next few weeks. 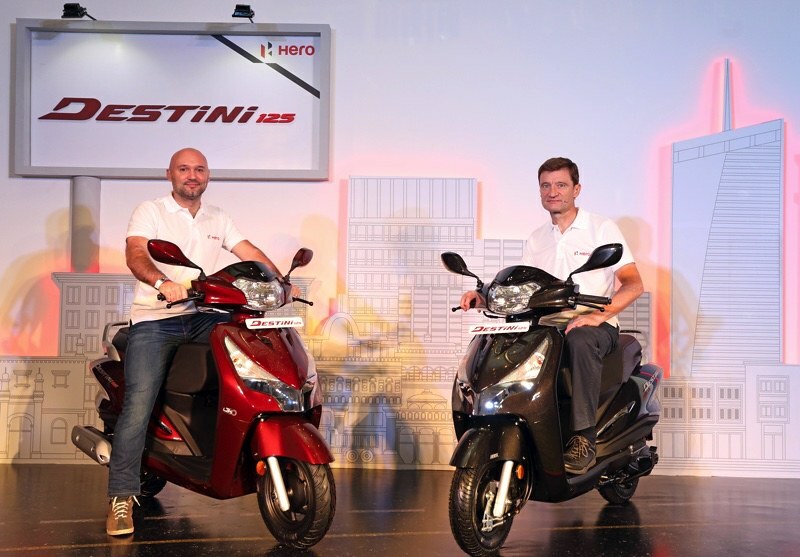 The new Destini 125 is the first and only scooter in India to feature the highly efficient idle start-stop-system – based on Hero’s i3S technology. The Destini 125 comes with a 125cc Engine, with a power output of 8.7 bhp @6750 rpm and maximum torque of 10.2 Nm @5000 rpm. The powertrain offers 17% higher torque and 9% higher power than the existing 110cc scooter as per Hero MotoCorp. As a first-in-class feature, the Destini 125 brings the intuitive i3S (Idle-stop-start system) to the 125cc scooter segment for enhanced efficiency. In addition, a digital-analog speedometer, side stand indicator, service due reminder, external fuel filling system, remote key opening, mobile charging port, telescopic suspension and an integrated braking system and boot light* makes it way in the feature list. Design wise, metal body with a bold premium chrome chest, signature tail lamp & winkers, side chrome garnishes, stylish cast wheels, new body color mirrors, and a dual tone seat cover is also offered. Four premium metallic colors are now offered with the scooter – Noble Red, Chestnut Bronze, Panther Black and Pearl Silver White respectively. Watch this space as we. get you the full road test review of the Hero Destini 125 very soon.